You should have an active Skype account and an active facebook account. If you don’t have then first create these account . Download Skype application and enter your user name and password in it. After logged into Skype account click on the tab with a Facebook icon on it. As you do for any other application approval . here also you have to log in first and then grant it some permission. You have done it. Now you will get your newsfeed within your Skype application where you can post your updates, like status and comment on them. 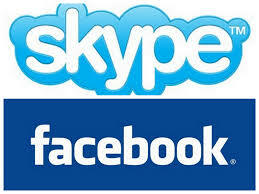 Now all of your facebook friends will be visible here and you can start chat with them in Skype.